This hearty and delicious one-pot meal is a step up from your typical chicken soup thanks to the addition of smoky chorizo. The Mexican sausage is available at most supermarkets, and adds tons of flavor with its unique mix of spices. The soup comes together in under an hour, which makes it a perfect comforting dinner for weeknights when you don't have a ton of time. If you prefer, you can use chopped plum tomatoes in place of canned during peak season. Stirring in baby kale at the end gives it a vibrant and gorgeous color with a bonus nutrient boost. Don't confuse Mexican chorizo with the Spanish version, which is cured with a different mix of spices and stored at room temperature. Mexican chorizo contains raw pork, and needs to be refrigerated. Look for at at your local butcher shop if you can't find it at the supermarket. Per Serving: 602 calories; 35g fat; 18.9g carbohydrates; 55g protein; 229mg cholesterol; 1610mg sodium. I love this soup! It's really hearty with lots of flavor. Instead of white beans I used chickpeas and it worked really well. Perfect for cold days! 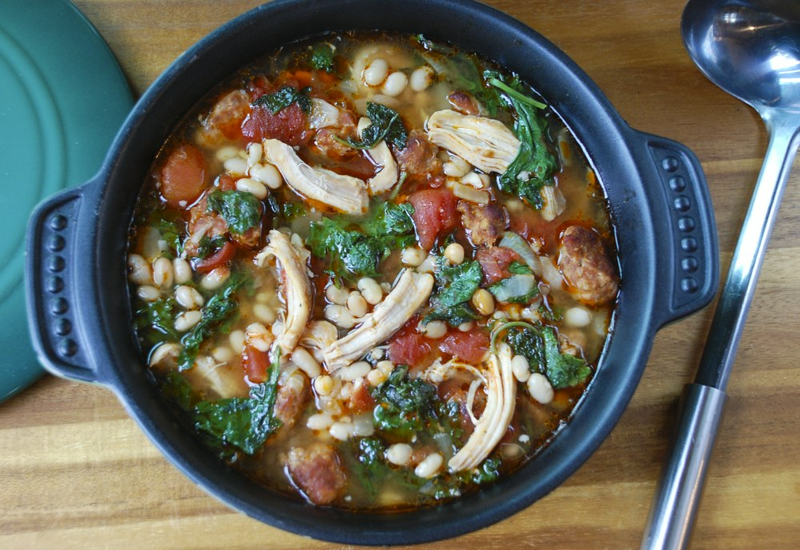 This soup is one of my fall favorites! The chorizo gives it a nice kick. If you're looking for a delicious, hearty, and nutritious comfort food soup, try out this recipe! I love it.